Whitehouse FFA Alumni is hosting a Donkey Basketball game! It's going to be AMAZING! The City of Whitehouse Fire Department , Whitehouse Area Chamber of Commerce and city officials, Whitehouse FFA Alumni, and Whitehouse ISD Education Foundation are all getting on donkeys. Guess what else? Your principal could have to kiss a donkey! Tip jars will be placed at each participating campus after testing. 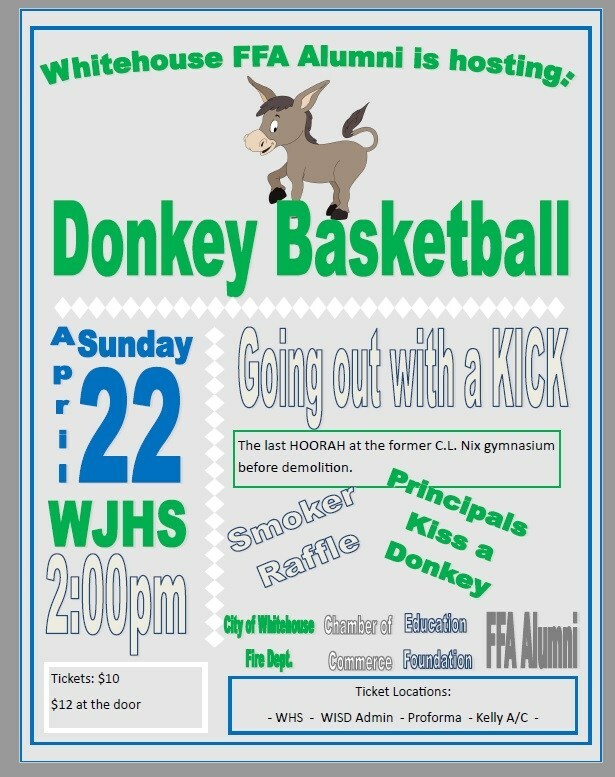 The principal who raises the most money will kiss a donkey in between basketball games. This is the last kick-off before demolition at the Junior High! Make sure you're there. Tickets can be purchased at Whitehouse High School in the CTE office, Whitehouse Admin., Kelly's A/C in Whitehouse, and Proforma in Whitehouse. We can't wait to see you there! Come cheer on our teams!